We at the Thalassemia Society are committed for Prevention and Awareness drives in and around Pune. We have set a goal to achieve ZERO Thalassemia birth of new Patients in Pune by the year 2020. As a part of this, we are planning to cover all corporates and colleges. We have conducted major awareness campaign in Infosys, Wipro, Fiat, VW, to name a few- where we have collected more than 500 samples for screening and are in process of counselling affected people with Thalassemia Trait. We are in process of similar mass awareness campaign / screening for prevention in various communities to create awareness of the disease condition . The Thalassemia Society Pune Chapter was founded by patients, parents and friends affected by Thalassemia. The foundation provides hope, comfort and encouragement to those battling this disorder. At the heart of the organization is a strong desire to help improve the quality of life for all patients with Thalassemia. We volunteer our time to organize conferences, raise funds to educate the community, ensure patients and parents know the latest in care.The foundation maintains a strong relationship with the medical community that provides diagnosis, treatment and care. Disclamer:The information on our web site is for educational purposes only and is not intended to substitute for informed medical advice. You should not use this information to diagnose or treat a health problem or disease without consulting a qualified health care provider. 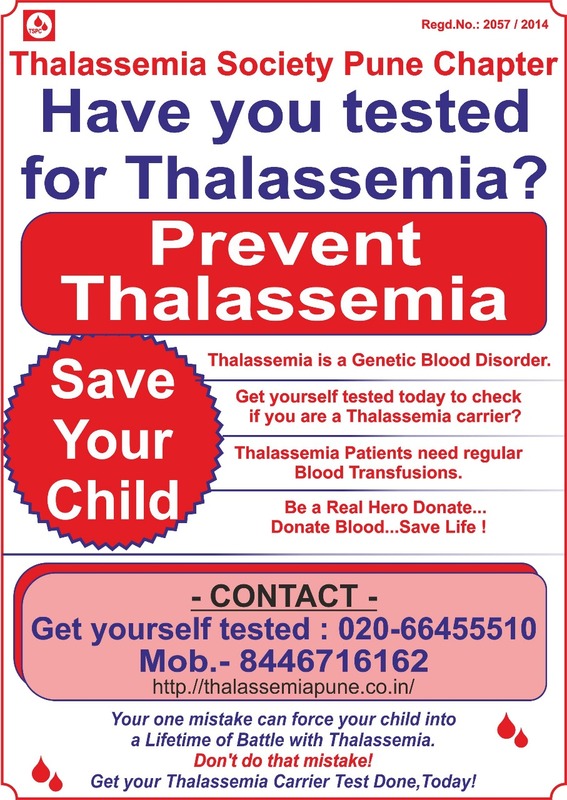 Thalassemia Society Pune Chapter strongly encourages you to consult your health care provider with any questions or concerns you may have regarding your condition.